It’s becoming something of an annual back-to-school story: schools that can’t open on time after being devastated by floods. This year it’s Round Lake Park, Illinois, where the deluged W.J. Murphy Elementary School conjures “a bait shop or a bag of wet, dirty laundry,” the Chicago Tribune reported. The library, gymnasium-cafeteria, music room, and several classrooms are flooded, and officials aren’t sure if the building will open on time for the start of school at the end of the month. Last year, it was Baton Rouge, Louisiana; three of the 17 damaged schools will remain closed this school year as well. 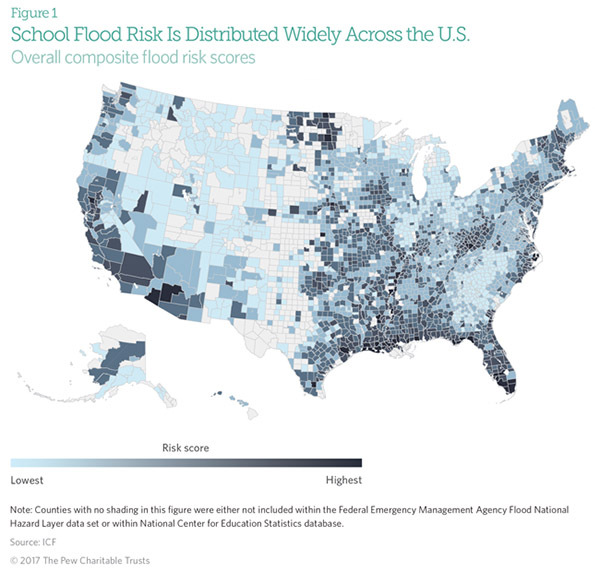 And there are likely to be more: The 100 counties most at risk of flooding contain 6,444 schools educating more than 4 million students, according to a new report from The Pew Charitable Trusts. 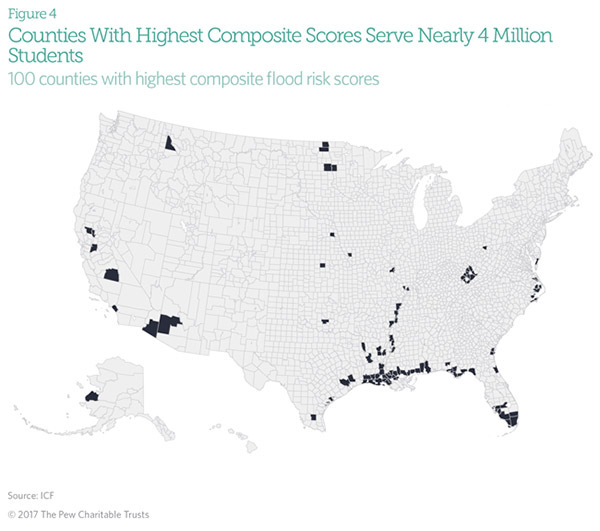 To rate the counties most at risk of flooding, researchers first assessed each school’s flood risk on three factors: whether the school itself is in a floodplain; if the surrounding community is at risk of flooding (which would affect transportation and student and faculty homes); and the history of federal disaster declarations. They then averaged the risk for all schools in a county to get the county-level risk. Nearly a quarter of the 100 counties most at risk are in Louisiana. 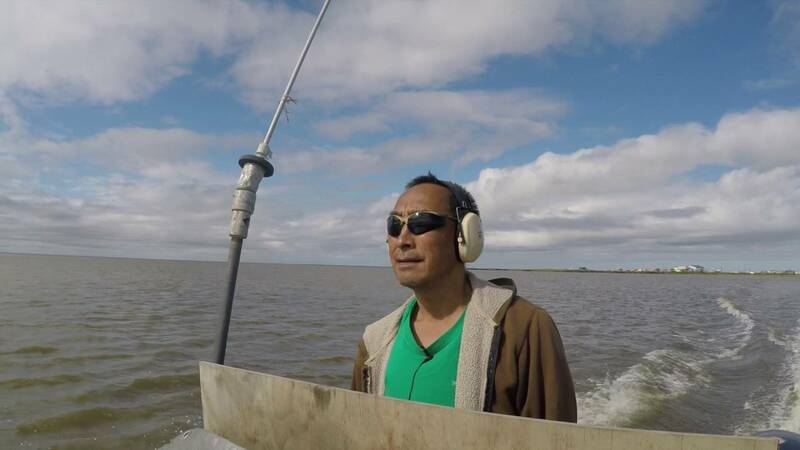 Though many of the Louisiana communities at risk are on the coast, inland counties are at risk as well, researchers said. The inland counties most at risk are Alexander County, Illinois; Maricopa County, Arizona; Crittenden and Mississippi counties, Arkansas; and Tunica County, Mississippi. The coastal counties most at risk are: Monroe County, Florida; Hyde and Tyrrell counties, North Carolina; Cameron Parish, Louisiana; and Poquoson City, Virginia. 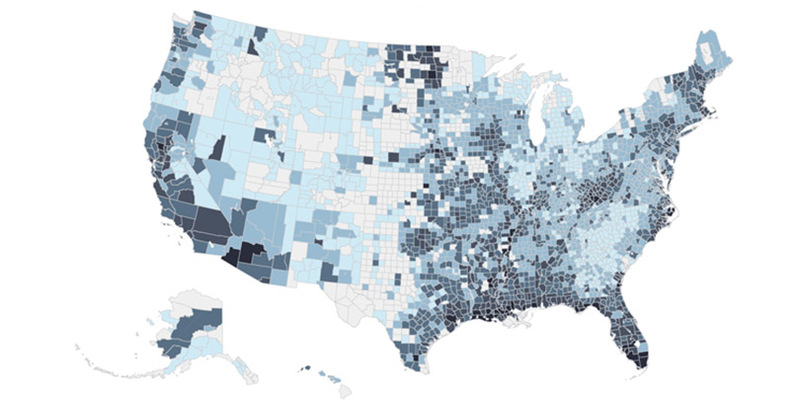 Among school buildings specifically, 2,247 are located in the worst flood zones. The most are in the South Atlantic, which researchers defined as Georgia, Florida, North Carolina, and South Carolina. There are some gaps in the data: there are no federal flood map data for about 12,000 schools, Lightbody said. That includes New Orleans, the site of perhaps the best-known flooding in recent memory after Hurricane Katrina. 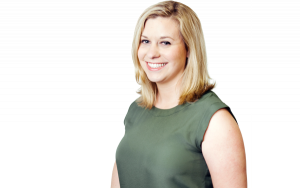 Researchers weren’t able to account for local flood mitigation efforts, like levees, or for sea level rise caused by climate change, Lightbody said. “We’re going to see the impacts [of flooding] expand to more locations,” she said, noting that it’s important to pay attention to flood risks in inland areas as well. The report’s authors recommend that federal officials update flood maps and work with local decision makers to better understand possible flood risks for schools. Officials should also develop pre-disaster plans for schools, and when communities do rebuild after a flood, they should account for future risk, including considering moving schools out of flood-prone areas, the authors said.